SOUTH KOREA : Euronews has reported that per assessment of political analysts , North Korea has emerged the winner of one of the Winter Olympics’ most important medals, the diplomatic gold, because of its charm offensive in full display during the sporting event. 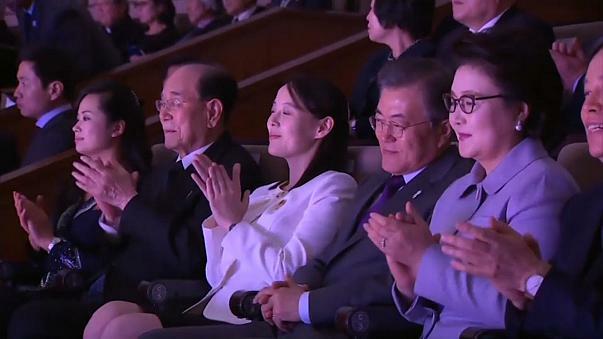 The delegation, headed by North Korea’s ceremonial head of state, Kim Yong Nam, and the sister of North Korean leader Kim Jong-un, Kim Yo Jong, capped its final day in South Korea by joining South Korean President Moon Jae-in at a Seoul concert of a visiting North Korean art troupe. First, there was the historic moment at the opening ceremony where South Korean President Moon Jae-in was seen shaking hands with North Korea’s ceremonial head of state, Kim Yong Nam, and the sister of North Korean leader Kim Jong-un, Kim Yo Jong. They all watched a ‘unified’ Korean team march under a banner showing an undivided Korean Peninsula. Then, the Saturday lunch at Seoul’s presidential mansion between Moon and Kim Yo Jong resulted in a rare invitation for Moon to visit Pyongyang for a possible summit to end decades of hostilities. Nothing has been settled on any trip north by South Korean President Moon Jae-in. But the verbal message to come at a “convenient time” from dictator Kim Jong Un, delivered by his visiting younger sister, Kim Yo Jong, is part of a sudden rush of improving feelings between the rivals during the Pyeongchang Olympics.